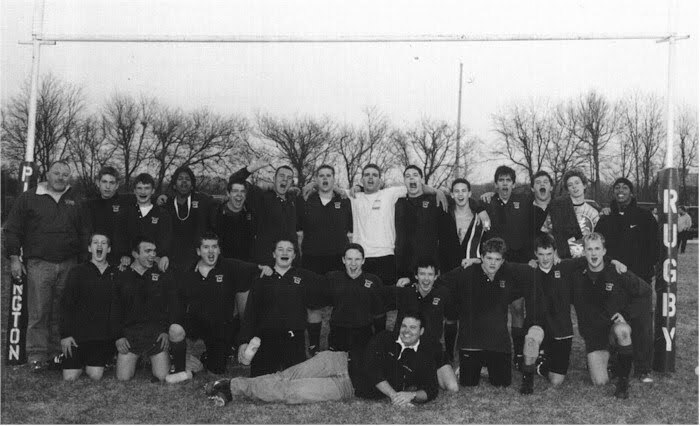 In early 1999, two guys decided to create a rugby team in the little town of Pickerington, Ohio. One was a teacher at the local high school and the other was his brother-in-law. One day the teacher said to his brother-in-law, "Would you help me start a rugby team?" The brother-in-law said, "Are you serious?" The teacher said, "Yes, I am!" Then, the brother-in-law said, "You recruit the boys and I'll train them." And that is how it all started. The teacher was Coach Craig Orr and his brother-in-law was Coach Jake Sherman. Little did they know what they were getting themselves into. The first year was difficult and had lots of bumps in the road. But, along the way, the team was started and things started to improve. By the end of the first season, there were 24 players on the roster. There were no wins the first year and EVERY game was an away game, due to the fact that the team could not find a field to practice on or have home games on. But, team moral was high and the boys really enjoyed the game. The second season was a little better with more scoring and two wins. The roster was still around 22 and there were three coaches to help out. The players gained experience and so did the coaches. Rucks and mauls were being won as well as scrums. Things were definitely improving for the better. At the end of its third season P.R.F.C. 's final record for 2001 was 6 wins and 7 losses and captured fifth place in the city of Columbus. The team has improved greatly this year. In part, due to veteran players and in part, due to recruiting more talented athletes. 2002 was a great year, finishing 6 and 8. We went to the state tournament and we made it into Division I for the 2003 season. 2002 was a staring point for many great things to come. As for 2003... It was our best season to date. The team finally came together and they really understood their potential. The team finally got to travel out of state to the Midwest tournament and finished 10th in the Midwest. The following weekend was the state tournament, where we finished a very respectable 3rd in the state. Throughout the years that followed, PRFC has continued to improve, including going back to the Midwest tournament several times, winning the Ohio Rugby Classic, and even topping off a 7's State Tournament run by taking home the Championship in 2016!